Humaira is a 25-year-old Rohingya refugee from Maungdaw district in Rakhine state. 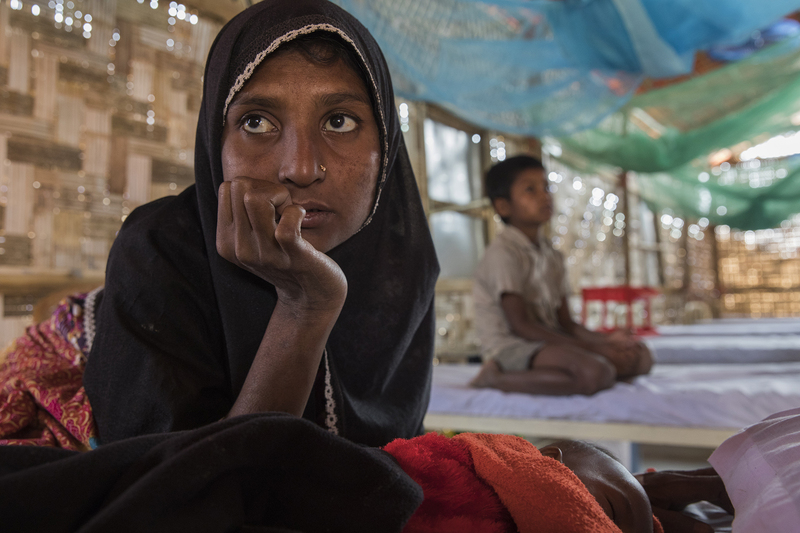 She arrived in Bangladesh in October 2017, after the violence reached her hometown. 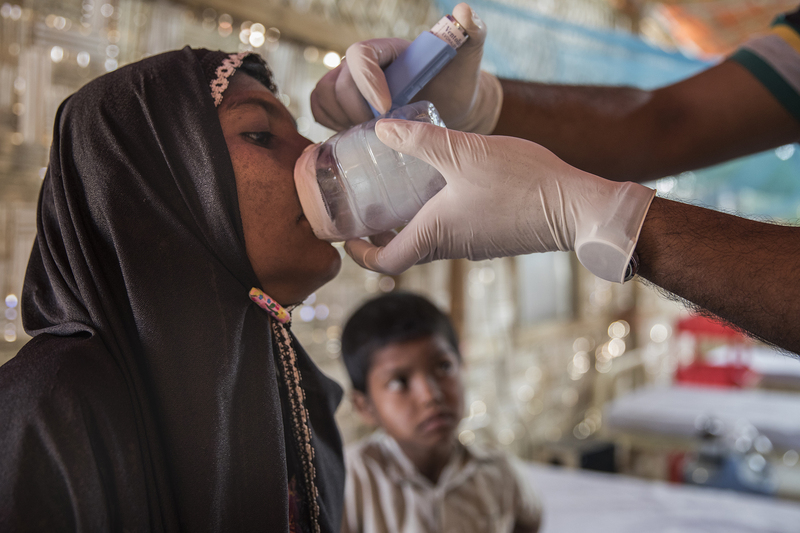 In late January 2018, she was found in a state of shock by an MSF outreach team in the Jamtoli makeshift settlement and brought to the MSF primary healthcare centre there, where she is being hydrated with a cannula. When the violence broke out, my husband was taken by the Myanmar military. I don’t know whether he is dead or alive. They took us from our homes, burned them to the ground and beat us very badly. When we fled, I was already heavily pregnant. I left with my son and another woman, but lost contact to her during the journey. I couldn’t take any belongings with me. We walked for several days through the forest. We were starving and only survived by eating the leaves of the trees. We slept in the bush. We finally reached the riverside and boarded on a boat that would take us to Bangladesh. After a month in Jamtoli I started to get some [humanitarian] relief. But I never have enough to eat and because of that I can’t breastfeed my baby. I felt sick in the beginning. I can’t sit down properly and can’t do some things due to the pain I feel in my body. All the food I get in the settlement is found by my boy [Mohammed Faisal]. He goes to school and plays football in the afternoon. He washes her sister’s clothes and fetches water. I have hope that he will help me through all the difficulties of the future. 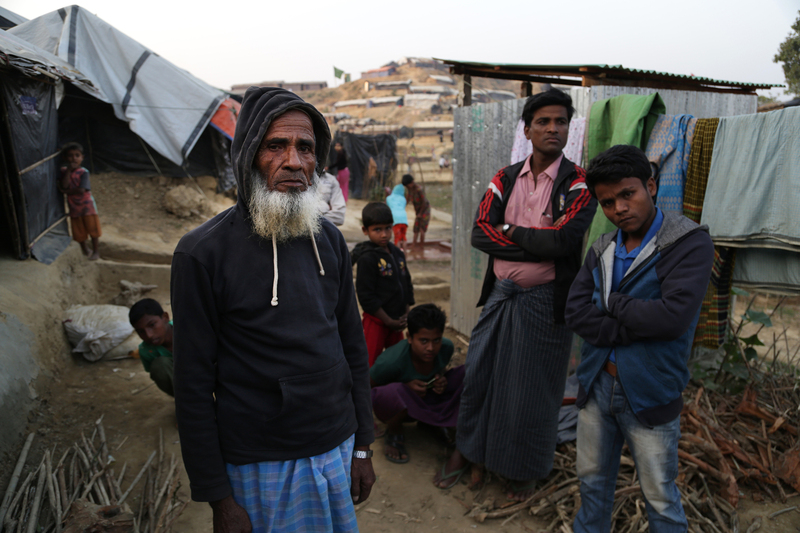 Ali Ahmed is an 80-year-old Rohingya refugee living in the Jamtoli makeshift settlement. He is from a town with about 5,000 houses in Buthidaung district, Rakhine. Ali Ahmed arrived in Bangladesh in the first week of September 2017. This is the third time in the last four decades that he has been a refugee in Bangladesh. Three different camps, more than six years in total, two return trips to Myanmar. He has been the father to six sons and one daughter; two of his sons died during an eruption of violence against the Rohingya in 2017. 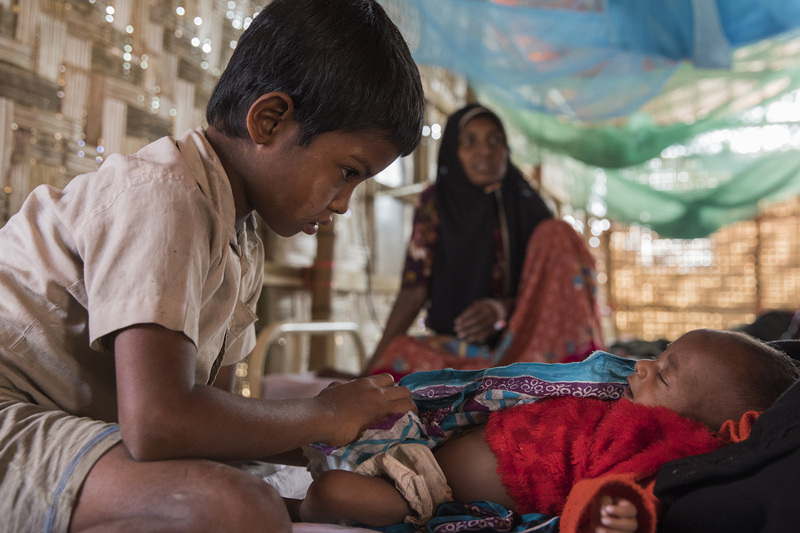 His now-deceased wife gave birth to two sons the first time they were displaced to Bangladesh. Before these events would shape his life, Ali was a curious young man who spent seven years working as a cook in a hotel in Rangoon (today Yangon). He had returned to Rakhine because he missed his family. It was February 1978, I was 40 years-old. My family were beaten and tortured. I fled with my wife and two children. On the way I lost some old photos from my time in Rangoon. I was very fond of them but they fell into the river during our journey. Once in Bangladesh, we stayed in a settlement in Ukhia. After three years we were sent back to the same area of Buthidaung. We were brought by bus and boat. After reaching our home town, we rebuilt our house in the same plot where the previous one had been destroyed. We made it with wood, with four rooms. We started cultivating the land around it. We lived there for some time peacefully, but gradually problems reappeared: our cows were sometimes stolen and we were often arrested. In 1991, it started to get a lot worse again and we decided to leave. I had been doing forced labour for four years. The army chose me because I spoke a bit of Burmese. I left my village with my wife, two sons, their wives and one grandson. It took us seven days to reach Bangladesh. We lived for four days in the forest as we made our way to the shores of the Naf river. After three more days we reached Bangladesh and, this time, ended up in Kutupalong. A larger part of my family remained displaced in different parts of Rakhine. I lost contact to them until I went home again in 1994. Life in Kutupalong was acceptable. There were about 18,000 people in the camp. Boshir Ullah is a 25-year-old refugee newly arrived in Bangladesh from Myanmar. He reached the Bangladeshi shore on 28 January 2018, more than five months after the latest exodus of Rohingya refugees started at the end of August. Boshir is from a village with about 50 houses in Buthidaung district. He arrived in Bangladesh with his 20-year-old wife Sundara, his 60-year-old mother Dutu and three small children, Hussain Ara (three), Bushera (five) and Ferungada (one). 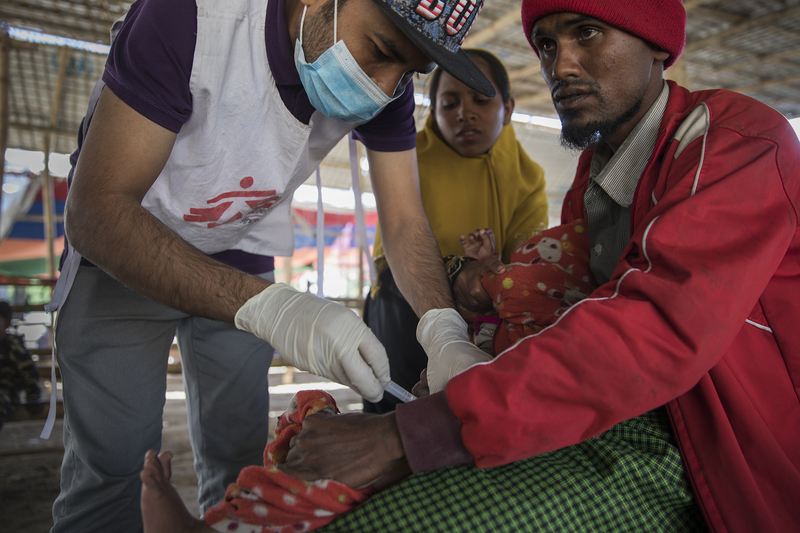 A day after they arrived, the family reached the Sabrang entry point in the south of the peninsula, where an MSF team does nutritional screening of children, checks the medical condition of new arrivals and carries out some vaccinations. That day, 41 people arrived to Sabrang in different groups after a whole week with no new arrivals. Some of them said that between 1,000 and 1,200 others were waiting to get a boat across the Naf river. In the days that followed, several hundred people arrived in Bangladesh. I didn’t have any relatives in Bangladesh and had never been to here before. My two aunts and grandfather are still in Myanmar. They wanted to come, but they can’t because first they need to sell their cows and goats to get the necessary money. We didn’t have any choice but to leave… I didn’t want to stay any longer.